A Bati 800 in The Lost and Damned. 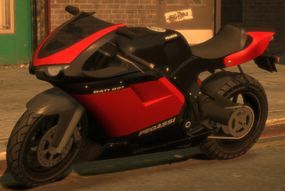 The Pegassi Bati 800 is a sports bike in The Lost and Damned episodic pack for Grand Theft Auto IV. The Bati 800 is depicted as an upmarket sports bike to match or beat the likes of the NRG 900. The bike is largely modeled on the Ducati 848 or the Ducati 1098, the tail unit bearing more of a resemblance to the self-supporting item of the Ducati Desmosedici RR minus the top-exit exhausts. Even as its performance and light body weight is considerably good and already ranks above nearly all choppers in TLAD, the Bati 800 is at the lower-end of the high-end bikes, with the slowest acceleration and top speed (297 kmph) among the Bati 800, Double T and Hakuchou. However, the bike's lower engine power is a blessing in disguise; it gives the bike better stability during accelerations and cornering, and minimizes excess burnouts and spinouts. The Bati 800 is a gang vehicle of the Uptown Riders. A distinctive red and white Bati 800 can occasionally be found at the players safehouse or on the streets if the player is ridding around on another Bati 800. A unique lime green and light orange Bati 800 can be found in the beginning of Malc's first random character encounter. The Bati Custom is a customized, sportier version of the Bati 800. The name Bati may be derived from the term "Batty" which is a derogatory slang term for a gay or effeminate man. Contrary to its actual name, one of the bike's badges and the Uptown Rider's website give the bike's name as the "Bati 801." The Bati 800 plays The Beat 102.7 by default when ridden. Commonly spawns in Northwood and East Holland, Algonquin, where the Uptown Riders are commonly found. One is parked on the street behind the building where the shootout with NOOSE agents occurs in Buyers' Market, if Johnny goes out the back door. Bati 800s will spawn at the player's safehouses as a reward for completing Angus' Bike Thefts. This page was last modified on 25 December 2013, at 13:29.